Fire extinguishers are something you pass by all the time and even if you are familiar with them and know what they look like, have you ever actually given much thought about how you use them? While it’s true that using one is mostly common sense, there are some basics you must understand to effectively fight fire. Most people don’t know how to use a fire extinguisher, including many that have them in their own homes. With an average fire doubling in size every 60 seconds, you don’t have time to be learning on the job. In this article, you’ll learn the basics that apply to nearly all fire extinguishers, from the different types to how to use them. There are various types of extinguishers available, and each is designed to handle different types of fire. Classification systems have been introduced to help you understand the kind of fire extinguisher you should be using. You’ll find the majority of extinguishers are Class ABC. This means they’re capable of putting out electrical, flammable liquid, paper and wood fires. These use dry chemical mono-ammonium phosphate as their extinguishing agent. If you’ve worked in a commercial kitchen, you’ll have come across Class K fire extinguishers, also known as Wet Chemical fire extinguishers. Wet potassium acetate is the agent used in these. Interestingly, as sodium bicarbonate powder was used as the agent before potassium acetate, baking soda can be an effective way to put out small oil and grease fires if you’re in a hurry. They are generally used in commercial kitchens as they’re much more effective at handling and putting out grease fires and the chemicals used are not likely to cause damage to cooking apparatus and appliances. Schools and offices have extinguishers in place, but it’s down to you to have a fire extinguisher for your home. There are many states in the US where you’re legally obliged to have a fire extinguisher in your home, and whilst it’s not the law in the UK, they’re a crucial safety item to have. Fire extinguishers can prevent a small fire from becoming a life changing emergency. As a bare minimum, you should place at least one ABC fire extinguisher for each level. Generally, it’s a good idea to place them close to rooms where fires are likely to occur, such as the kitchen and the garage. Store them where your kids can’t touch or get to them, but so they can be easily accessed. Avoid storing them close to heating appliances and stoves, or behind drapes and curtains, as these are areas where fires often start and spread. If you can’t get to the fire extinguisher because the area it was stored caught fire, you’ve got a problem. Ideally, it is best to place them near a door where possible. When you’ve got fire extinguishers in your home, it’s vital to check them regularly to make sure they’re not damaged by rust, leaks, dents, and the hoses and seals are intact and the pressure is still in the green. If you notice anything that you’re not happy with, either seek professional advice or simply purchase a new one – it’s not worth the risk. So now you know the different kinds of extinguishers and where to position them. It’s time to learn how to actually use them. How do you know a fire is in the incipient stage? – Check to see if it’s taller than you and if it is, leave the property and call the emergency services. Do you have the correct extinguisher for the type of fire it is? – Remember extinguishers are designed to deal with specific fires. Using the incorrect fire extinguisher on a fire can make matters worse. Is your extinguisher pressurized? – Look at the gauge and make sure it is fully pressurized and charged. If the needle in the gauge is in the green, it’s good to go. If not, you won’t be able to use it so your best option is to leave the premises. If possible, stand with your back to an exit free from obstructions, so you can escape quickly if necessary. The rate of discharge for fire extinguisher can range from 6 to 20-feet. It’s vital you understand the discharge range before you use it. You need to be positioned so you’re close enough to effectively handle the fire, but far away enough to avoid getting burned. PASS is an acronym that will help you to use the extinguisher properly. Aim the nozzle at the fire’s base, because hitting the tops is ineffective. Squeeze the extinguisher’s trigger in a controlled way, to release the extinguishing agent. Sweep from one side to another until you’ve put the fire out. Continue to aim at the base while you are doing this. Most fire extinguishers are able to produce 10 to 20 seconds of discharge. Slowly move backward. That is, even if the fire looks as if it has been extinguished and avoid turning your back to it. There’s often hidden fires or hot spots that could ignite into a bigger flame at any time which you should always be aware of. After using it, even if you haven’t used all the pressure, it’s important to recharge it fully. Do this as soon as you can. If it’s a disposable model, throw it away and buy a new one as soon as possible. 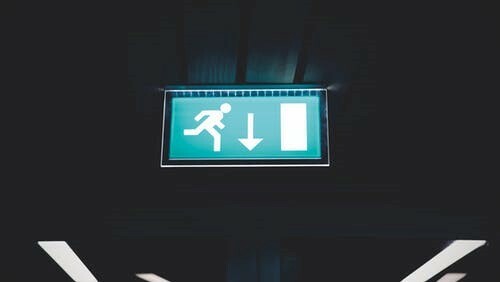 Does your household have an Escape Plan? Does your Smoke Alarm positioning meet Building Regulations?